Preziosi was of noble Maltese birth, but against the wishes of his family rejected their chosen profession of the law to become an artist. From 1842, until his death forty years later, he lived and worked in Istanbul, renowned for his vibrant and evocative images of all the different races and cultures of that most cosmopolitan of cities. He became for a time well-known in Western Europe because many travellers, (including in 1869 the Prince of Wales) took his pictures home as souvenirs of their visit. Demand for his work prompted the publication in Paris in 1858 of a series of lithographs, Stamboul Recollections of Eastern Life. This is a fine example of Preziosi’s keen observation of contemporary Ottoman life, rapidly sketched yet full of accurately depicted detail. 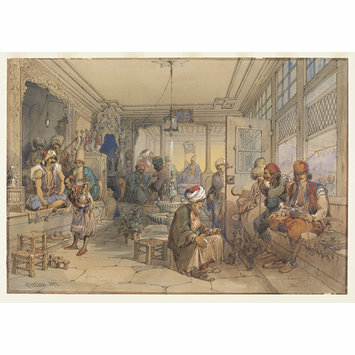 A large gallery of characters is portrayed, all of them evidence of the cosmopolitan character of nineteenth century Istanbul. On the left can be seen a saz (group of musicians); a Greek with a long çubuk (long cornel wood pipe) and a African youth applying a glowing piece of charcoal to the bowl, carrying at the same time a nargile (water-pipe); as well as a Mevlevî or whirling dervish in his distinctive conical külâh (felt hat). 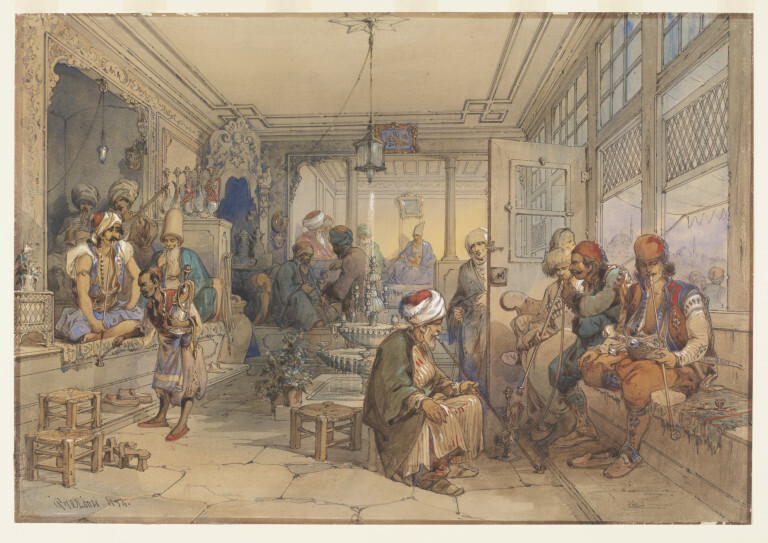 In the background are merchants, including a Persian. In the foreground is another merchant with a çubuk, and at the door an unveiled beggar-woman on her rounds. To their right are a Circassian with cartridges on the front of his coat, and two more Greeks smoking. The coffee house itself is a luxurious nineteenth century baroque structure, probably on the shore of the Golden Horn. The coffee house equipment is clearly shown: on the left a row of nargile with some spare tubes and a large water-pot; behind them, in the corner, the stove for heating the coffee and the charcoal for the pipes. Next to the Greek in the right foreground are a coffee cup and its metal holder. In the centre is an elaborate fountain, which cooled the room in summer. According to Rodney Searight: - `Bt fr Dowmunt, Feb.1971, £27'. An earlier version of the scene, signed and dated 1852, from the collection of Professor C.H.O. Scaife, was sold by Hunt's, Taunton, 3.5.89 (now Private Collection). Cf. Preziosi, Stamboul, 1858 [Pls. 25 & 29], lithographs (see SP.477:1-30).